The Terror Bird is one of the Creatures in ARK: Survival Evolved. Ranging from eight to twelve feet tall, Phorusrhacidae rapidesultor is a highly aggressive avian that is just barely capable of very brief "flight." Instead, it uses its wings primarily for balance during its high-speed sprints. Phorusrhacidae flight is actually closer to an impressive sustained leap or glide that is assisted and lengthened by flapping its wings. Phorusrhacidae shows interesting traits related to theropods such as Utahraptor, Carnotaurus, and Tyrannosaurus. It has many similar traits, such as general shape and predator patterns, but its attacks tend towards lightning fast dashes and beak slashes. Phorusrhacidae is an effective combat mount, particularly for harassing and scouting. Riders of Phorusrhacidae gain most of the benefits of a fast, mobile ground-based theropod, while also gaining some of the freedom of movement from a flyer...assuming the rider can coax Phorusrhacidae into staying in the air over a long leap. The Terror Bird is an extremely aggressive avian species. Whilst they commonly travel in groups of 3 (occasionally 4), they can be seen (albeit rarely) on their own; caution is still strongly advised. Whilst typically found all over the island, the Redwood forest offers the richest source of prey, which includes the player if they are caught within their large aggro range. Therefore, they are most likely to be seen in and around this region. The Terror bird is a remarkably fast predator, making outrunning them on foot very difficult. A Terror Bird stands as tall as a man and is a highly aggressive carnivore. Having evolved to sprint in pursuit of small prey, Terror Birds have long legs and powerful hooked beaks designed to tear flesh and crush bone. They have traded the power of flight for this, having only vestigial wings, generally used for balance in high-speed chases in the dense forest. This section displays the Terror Bird's natural colors and regions. For demonstration, the regions below are colored red over an albino Terror Bird. The colored squares shown underneath each region's description are the colors that the Terror Bird will randomly spawn with to provide an overall range of its natural color scheme. Hover your cursor over a color to display its name and ID. 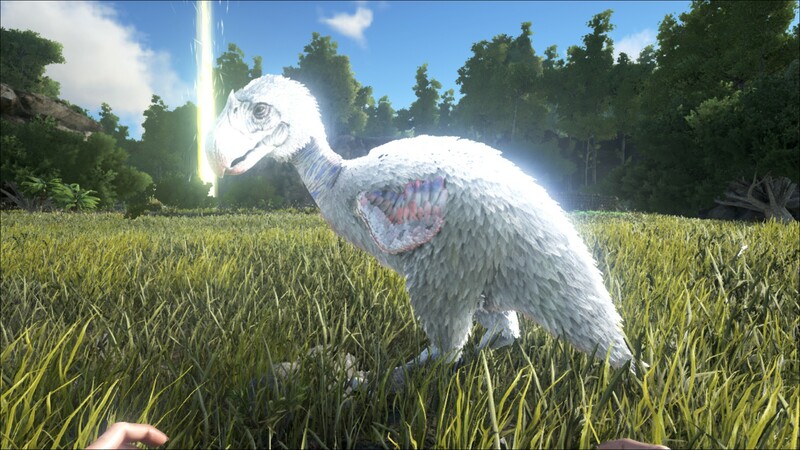 For example, "cheat SetTargetDinoColor 0 6" would color the Terror Bird's "feathers" magenta. 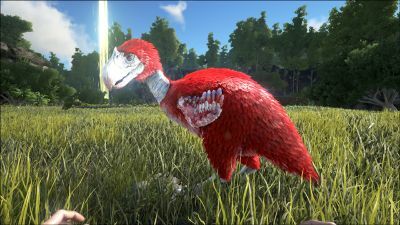 Using the (PC), (PS4), (Xbox One), the Terror Bird bites the target. This section describes how to fight against the Terror Bird. Terror Birds spawn in small clusters of three to four members, so be sure that you can handle multiple opponents. They are extremely fast and aggressive, patrolling the area while devouring anything they can get their beaks on. Be careful when exploring in their spawning areas, which includes the redwoods, the mountains and the rivers at the base of the mountains. Be sure to consider other animals while dealing with Terror Birds, as there are plenty where they spawn! If the Terror Bird is unable to reach you, it can not harm you. Fighting on the ground is not a good idea, as the Terror Bird is adapted to running and can easily overtake a player. Try to finish them off quickly before their damage adds up, as escape is not a viable option. Oddly enough, the birds sometimes get stuck on each other and cannot move. In this rare occasion, either run, kill or knock them out before they fix themselves. This is a bug, and it may be fixed in a future patch. Due to their pack nature, ranged weapons are best used to avoid being overwhelmed. If a melee situation arises, a sword or pike should be used to cause decent damage. Shotguns work rather well to deal high damage to one or two birds. The Terror Bird is a good sprinter, so make sure to stay away from it on open terrain if you are poorly equipped. Fast or durable mounts can evacuate you in a pinch, or they can simply aide in killing one. Be sure that other mountainous animals do not enter the battle, as a Rex or Giganotosaurus can easily turn a casual hunt into a nightmarish slaughter of beloved animals and helpful tribe members. Similar to the Raptor, the Terror Bird can easily be trapped on rocks and attacked with either a ranged weapon or a pike. They do not have relatively high health, so they can be dispatched in a similar method to raptors. The Terror Bird, like some other creatures, has a special head hitbox, which make them take 3x more damages with headshots. If one Terror Bird charges you alone, the best weapons are bows or crossbows. Use iron arrows to make sure to one-shot it. The Terror Bird loses torpor quickly so make sure that you are stocked up on Narcotics when you knock one out. The Terror Bird is very fast and will usually circle around you, which can make it difficult to properly hit. It is recommended to lock the Terror Bird in place to not waste ammunition by either grabbing it with an Argentavis or Quetzal, lure it into a prepared trap like a 1x1 stone house without ceiling, or use a Bola. Sniper's Mount: It has the mobility to get you around and out of trouble during your field sniping. When hunting or in PvP, it will serve a sniper well. Prime Harvest: Due to their hooked beaks, the Terror Bird can more efficiently harvest prime meat from larger predators than most other mounts. Cave Glider: Being the closest thing to a mountable flier in a cave, the Terror Bird safely makes jumps with its glide ability that would often be treacherous with other mounts. Its initial vertical jump is also useful, especially in the North East Cave. To glide press and hold the jump button (default space). The Terror Bird will glide with the same speed it was running when you jumped. This gliding speed can be maintained for a good distance, but it eventually does start slowing down, and the bird will (gently) descend along with the decrease in speed. If you stop gliding the bird will start falling even if you hit space again afterwards. Flapping its wings will however reduce the falling damage. The Terror Bird's "genus", Phorusrhacidae, actually refers to the family informally known as Terror Birds rather than a particular genus. The skull that is seen in its dossier appears to be of the famous Terror Bird Phorusrhacos. 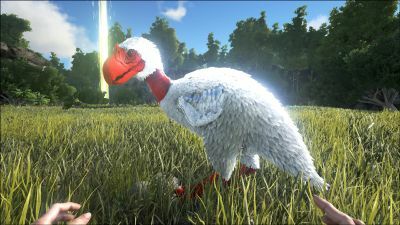 If this is the true identity of the Terror Bird seen in ARK, its true scientific name would be Phorusrhacos rapidesultor. They can be picked up by the Argentavis and Quetzal. The dossier image of the Terror Bird shows it with a vestigial dew claw, but the in-game model of the creature lacks this feature. Despite spawning most commonly in the mountains, real life Terror Birds were plains dwellers that hunted out in the open. In game, a Terror Bird can glide quite long distances, something that isn't seen in its real life counterpart. ↑ Introducing the Terror Bird! This page was last edited on 14 April 2019, at 16:46.